Thank you for your interest in becoming a 2019 Orientation Staff Member. Below you will find more information on our positions, important dates, information on the hiring process, and the application. Thanks again for your interest and good luck in the process! If you are unable to attend one of these meetings and have questions regarding the position, please contact us at onsp@umich.edu or 734-764-6413. The Office of New Student Programs employs enthusiastic and resourceful students, representative of our diverse undergraduate population, as orientation leaders to assist with summer new student and parent orientation. For duties, expectations, and employment conditions of parent and student leaders, please see the attached position descriptions and general information below. Each leader will be assigned to 16 or 17 parent sessions during the summer program. The average group consists of approximately 100-200 parents for whom the leader is responsible in cooperation with 2 co-leaders. Advance preparation for each group includes team planning, assembling informational materials, establishing meeting agendas, checking room set up, performing assigned office work, etc. Major job responsibilities include facilitating program check-in, a walking tour, informational meetings, escorting parents to and leading discussions of University offices/services, etc. Leaders are expected to actively engage with parents and provide overall support to make each program a success in accordance with the ONSP goals and mission. Each leader will be assigned to 16 or 17 freshman sessions during the summer program. Each leader will work with as a team of 10 leaders and will be responsible for approximately 175-200 students per session. Advance preparation for each group includes team planning meetings, stuffing folders, making door tags, establishing meeting agendas, assembling registration materials, setting up meeting rooms, residence hall preparation, etc. Major job responsibilities include program check-in, informational meetings, a walking tour, planned social activities, evening supervision, registration, etc. Leaders are expected to actively engage with students and provide overall support to make each program a success in accordance with the ONSP goals and mission. Orientation Leaders also facilitate a small group discussion focused on living and learning at U-M, academic and involvement questions and concerns, student health and safety, academic resources, decision-making strategies, and transitioning to U-M. Qualifications: Leaders must be undergraduate students at the University of Michigan and are required to have been enrolled during the fall and winter terms prior to their employment, having been in good academic and judicial standing for both terms. OLs should be able to assume leadership roles and complete all assigned tasks. Positive representation of the University of Michigan is required. Commitment to serving students, parents, and University staff, including diverse populations, and a customer service philosophy are necessary. Previous experience in a team environment is helpful, but not required. Time commitment: Orientation Leaders are required to attend all training sessions and staff meetings. Orientation Leaders participate in training on issues such as public speaking, group facilitation, social justice and bystander intervention, conflict management, teamwork development, communication skills, U-M resources, academic unit training, and a variety of other leadership topics. Orientation Leaders may not have other time commitments during assigned summer orientation program sessions (4 days/week); however, many leaders have outside employment or engage in independent research on their days off, with your orientation schedule taking precedence over outside employment. It is not possible for orientation leaders to be enrolled in spring or summer term classes at the University of Michigan. All selected leaders will be given a schedule of expected coverage in advance so that you may plan personal time accordingly. Training begins during the Winter 2018 semester. Orientation sessions begin in early June and run through early August. Be punctual, reliable, and conscientious in the performance of all responsibilities. Submit an end-of-summer evaluative report. May not be enrolled in any spring or summer session courses. Independent study/research projects may be permitted with supervisor permission. May not have an outside job during the summer or pre-conference training. Employment on days off during summer program is permitted with supervisor permission. Must follow all state/local laws and University policies regarding alcohol and other drug use. Must not consume alcohol when on-duty. Off-duty leaders may not use, or be under the influence of, these substances in the presence of any orientation participants. Must adhere to and enforce the University's rules and regulations. Orientation Leaders will be paid $12.50 per hour. Meals will be provided during the Orientation program. Orientation Leaders will receive staff apparel. The application process for 2019 is closed. Please check back in Fall 2019 for information on the 2020 Orientation Leader position. Applicants must complete an online application by TBD at 5:00 p.m. All applicants will be required to provide the names of two references as part of this application. Applicants will be notified if they have moved on to the individual interview round on TBD. At the conclusion of the individual interview round, candidates will be notified of their status by TBD. Individual interviews will take place by invitation only from TBD. Candidates will be notified of their status on TBD. Saturday, March 16, 9:00 a.m. - 6:00 p.m.
All staff must attend a Transfer Orientation training on May 10 and assist in staffing Transfer Orientation May 13-16, 2019. All staff must attend a mandatory two week training period prior to the start of the Orientation program. This training will be May 20-24 and May 28-31. Staff must be available to work for the duration of the Summer Orientation program. Orientation sessions will occur the first week of June through the first week of August. Thank you for your interest in the 2019 Summer Orientation Leader position. The application for these positions are now closed. Please check back in Fall 2019 for information on the 2020 Orientation Leader position. Staff are required to live in the orientation residence hall to provide assistance to orientation participants during the evening and overnight portions of the program. Staff will provide evening and overnight support for the program including: lock outs, participating in building safety rounds, scheduled shifts at the Orientation duty table, maintaining and updating floor signage, enforcing of policies, and responding to emergency situations. Staff must maintain high personal standards in behavior, appearance, and attitude. They are also expected to demonstrate professional and appropriate relationships with students, parents, and other staff members during the programs. Orientation Residential Staff will work closely with the Orientation Graduate Intern, Orientation Assistants, Orientation Leaders, Conference Community Assistants, and Housing Security to facilitate the evening operations of the building. On-duty staff may not drink any alcoholic beverages or use any other drugs that may diminish alertness or effectiveness. Off-duty staff may not use, or be under the influence of alcohol and other drugs in the presence of any orientation students or parents in the orientation program. Work in a team environment to administer the evening and overnight aspect of the Orientation program. Prepare for orientation sessions by attending team planning meetings, making door tags, decorating floor bulletin boards, etc. Facilitate early arrival meetings and activities with students arriving the day before their Orientation session. 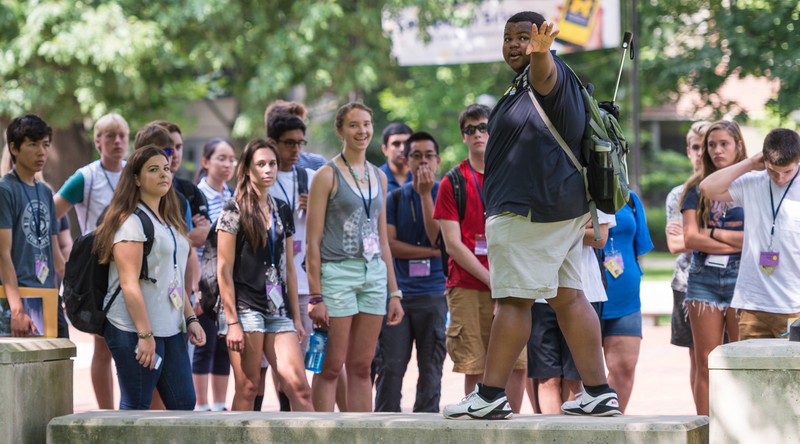 Orientation Residential Staff will participate in training on bystander intervention, conflict management, teamwork development, communication skills, U-M resources, safety and security procedures, and various other topics regarding the Orientation program. Job requirements also include other duties assigned by ONSP professional staff relating to the evening component of the Orientation program. The Orientation Residential Staff position requires consistent availability throughout the summer orientation program, May 24 to August 2, 2019. Staff are required to be punctual, reliable, and conscientious in the performance of all responsibilities. Any absences must be negotiated in advance with a supervisor. Staff are required to attend all training sessions (May 24, May 28-30). Staff will work a consistent 4 nights per week to be assigned by ONSP. Staff must be available to work assigned shifts from 9:00pm – 1:00am when Orientation is in session. When scheduled for a shift, staff must reside in the building overnight until 8:00am in order to respond to the needs of program participants and to potential emergency situations. Staff will be assigned approximately 18 hours per week of active programmatic coverage including staffing of the duty table, building rounds, and preparation for orientation sessions between the hours of 9:00pm and 1:00am. Staffing will serve in an “on-call” capacity for the remainder of each night assigned until 8:00am. Staff may be enrolled in summer classes and/or seek additional employment contingent upon these additional opportunities not conflicting with Orientation responsibilities. Orientation Residential Staff are required to have been enrolled in the fall and winter terms prior to their employment (with the exception of early graduation) and to have been in good academic and judicial standing for both terms. Orientation Residential Staff will receive room and board from May 24 to August 5, 2019. Staff enrolled in U-M Summer Term classes will have the option to have their residential space extended until the close of the term. Orientation Residential Staff will receive a weekly stipend of $75 beginning with staff training on May 24 and ending on August 5, 2019. Orientation Residential Staff will receive staff apparel. How To Apply: Please fill out the following form by Sunday, March 24 at 11:59pm. Each year, the Office of New Student Programs (ONSP) coordinates two orientation programs for students who were unable to attend orientation programs earlier in the summer: International Orientation (August 26 – 30, 2019) and Fall Orientation (August 28 – August 30). ONSP also coordinates the Welcome to Michigan program (August 30 - September 2). ONSP is seeking enthusiastic and helpful students to serve as Orientation Leaders to help implement these programs. This is a paid position at the rate of $9.50 per hour. Orientation Leaders will be assigned to work in various shifts between August 25 – September 2. If you are not available for ALL of the above dates, your application may not be considered. The remainder of dates will require some, but not all, Orientation Leaders to work, and the hours will vary. Your exact work schedule will be provided at the August 25 training session. Applicants are chosen based on the information provided in this application. The application is designed to better inform us about your personal background, work history, academic history, and interest/motivation for becoming an Orientation Leader. Be clear and concise in your responses. In the section below, indicate the dates when you would be available to work, keeping in mind that August 25, 26, 28, and 30 are REQUIRED for this position. Students who are not available on these dates will not be hired. Eligibility: Leaders are required to be undergraduate students who are in good academic standing who were enrolled in the Winter term prior to their employment. Previous campus tour guide experience is helpful. Generally, a 2.5 GPA and no residence life or OSCR offenses are necessary to be selected as an Orientation Leader; exceptions may be made. Please explain your academic or judicial record(s), if necessary. Training: Leaders are required to attend training on Sunday, August 25 from 11:00 a.m. – 6:00 p.m. Location is TBD. Performance: Leaders are required to be punctual, reliable, and conscientious in the performance of all responsibilities. If lateness, absence, policy violation, or poor performance becomes a problem, ONSP reserves the right to dock pay as necessary. Leaders must follow all U-M and ONSP policies. Salary: Each Leader will receive $9.50 per hour, plus breakfast on Monday and Wednesday and lunch on Monday. Total number of hours will vary, depending on which shifts you have been selected to work. On average, Orientation Leaders will work between 20 – 25 hours in total between August 25 – September 2. Leaders will also receive a Welcome to Michigan t-shirt. Orientation Leaders who have a Fall 2019 residence hall contract will be able to move into their assigned space on the morning of August 25 (except Martha Cook). You will receive three meals during the program, but you will not be able to have meals in your residence hall until your regular contract begins. We cannot make arrangements for Leaders to move into the residence halls any earlier than this date. We cannot provide special housing arrangements for Leaders who are living off-campus and do not have a residence hall contract. 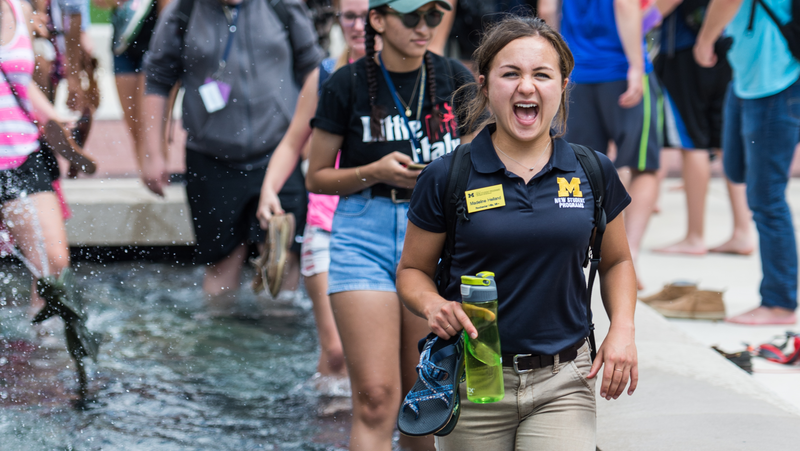 Being an Orientation Leader is a way for you to give back to the university community, assist new students and their families with their first few days on campus, and meet new people. Questions? Contact Brynn Arnall at bmarnall@umich.edu.